Belly wrapping, or binding, has been an important post-partum recovery tool for thousands of years. Although many in the Western World are unfamiliar with the benefits of belly wrapping, millions of women throughout Asia, South America, and other countries use various styles of wrapping to speed up the healing process after childbirth and make their recovery more supported and comfortable. I'm very excited to be offering Bengkung (Indonesian-style) belly wrapping as a an optional service for my birth doula clients and any other women who are interested. Belly binding in the benkung style. Although there are many binders on the market available for women, most of them are made from polyester or nylon with elastic. These fabrics are not as comfortable, supportive, or adjustable as the traditional wrapping methods, which always used narrow strips of woven fabric, usually cotton. The Bengkung style also has the advantage of being beautiful, and not difficult to do yourself. And as you lose the baby weight, you adjust for this as you wrap, and never have to worry about buying a different size wrap or the elastic sections stretching out. Bengkung wraps are about 14 YARDS long and 7" wide, and are made from beatiful cotton batik fabric. They are machine washable and can be reused, passed on to another mother, or even made into mei tai baby carrier straps or clothing. The possibilities are endless! Whether you are a birth doula client of mine, or simply wish to reap the benefits of postpartum wrapping, I am happy to help. Includes wrap (55$ value), also 2 post-partum visits to your home where I will wrap the belly wrap for you and explain how to do it. I will also leave printed directions and be available to answer any of your questions by phone or email. If you have a vaginal birth, you may start wrapping as soon as you wish. Mothers who give birth by cesarean should typically wait 4-6 weeks, or until they are told by their care providers that they are healed enough for belly wrapping. Includes the belly wrap and instructions. Wraps are 15 YARDS long (at least) and 7.25" wide, made from locally-sourced 100% cotton batik or organic cotton muslin. 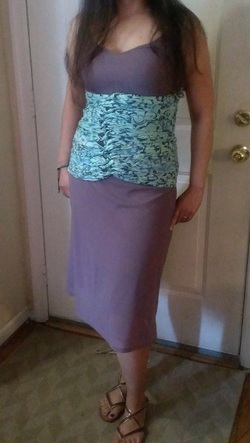 I will usually have several different colors available, and the wraps can be worn over or under your clothing.